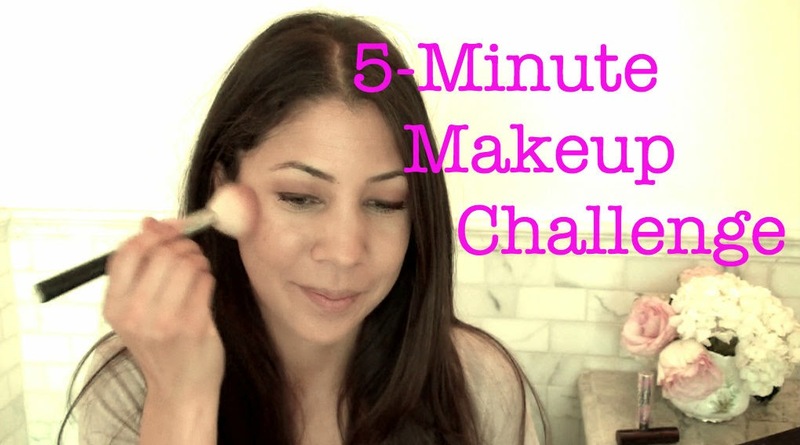 This week's video is a fun challenge that has been circulating around YouTube: a 5-Minute Makeup Challenge. I set the timer for 5 minutes and in real time attempt to do my complete makeup routine. I got a little ambitious and decided to add eyeshadow (you know my 5-minute le no makeup look does not include eyeshadow) and the results are quite funny. I hope you enjoy this video! I am also tagging three of my favorite YouTubers: The Glamorous Housewife, TeriGigi and Melissa55. They all have really fun YouTube channels and you should check them out. Ladies, I hope you're up for the challenge! Even if you don't have a YouTube channel, it's quite fun to time yourself. See how much you can get done in 5 minutes. Then you can streamline a routine in that time and be well on your way to looking presentable always. 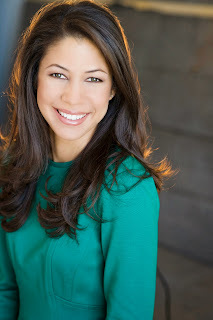 I am featured in Bankrate in an article called, Gain More by Spending Less. There will be a very exciting announcement this week so be sure to check back on the blog! Let me know what you think of this week's video in the comment section. And let us know if you have a 5-minute makeup routine. I look forward to seeing you later this week! For the past two weeks we have tried a radical experiment chez nous to see how we get along living with less. I'm talking a lot less. This wasn't necessarily by choice. It all started when we refinished the hardwood floors in our apartment. We had to take all of our furniture out. We removed everything from our home save the beds, side tables and dining room table. We even boxed up most of our clothing and saved just a few pieces in a suitcase (more on this interesting observation in a moment). 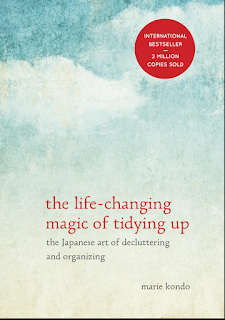 A while back, I recommended Marie Kondo's book, The Life Changing Magic of Tidying Up. 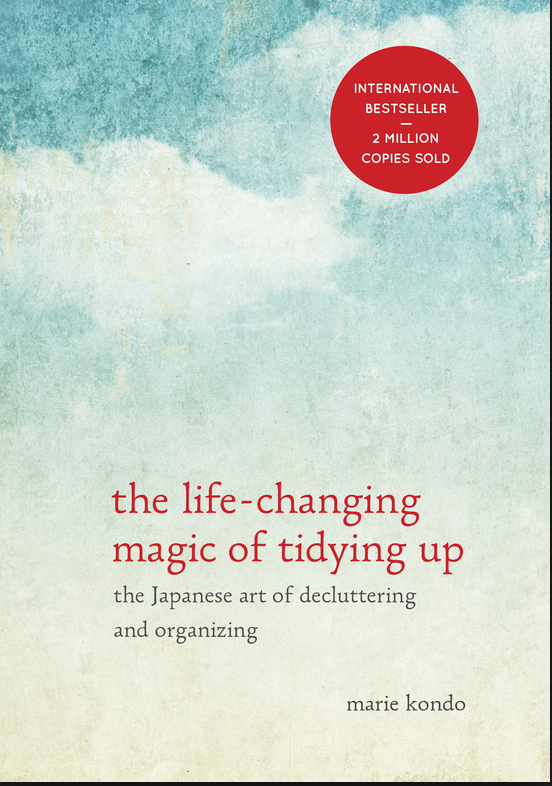 Ms. Kondo writes about radically getting rid of your possessions to understand the freedom of living with less. I was so happy I had read her book before doing this because I was quite excited to see how we would fare. It turns out (save for a few files and my beloved piano)... We didn't miss anything! What a surprising verdict! We are quite minimal with our belongings anyway compared to the average family, but over the years with two little ones, we did acquire quite the collection of this and that. One of the most surprising results is that the children didn't miss their toys! Their little playroom (which was really a play corner) was filled with bins of blocks, legos, dolls and art supplies among many other things. This space frustrated me because I felt it offered too much choice for them. They would play with one thing, get distracted and them move on to the next without putting anything away. Now with the toys all stored away, we bring out one puzzle, or get an art project going or keep out a rotation of around 5 books and they are still as happy as they were with all of their toys. In fact, they have been prompted to use their imagination more and have created things to do (like making a "midnight soup" from old food in the refrigerator). 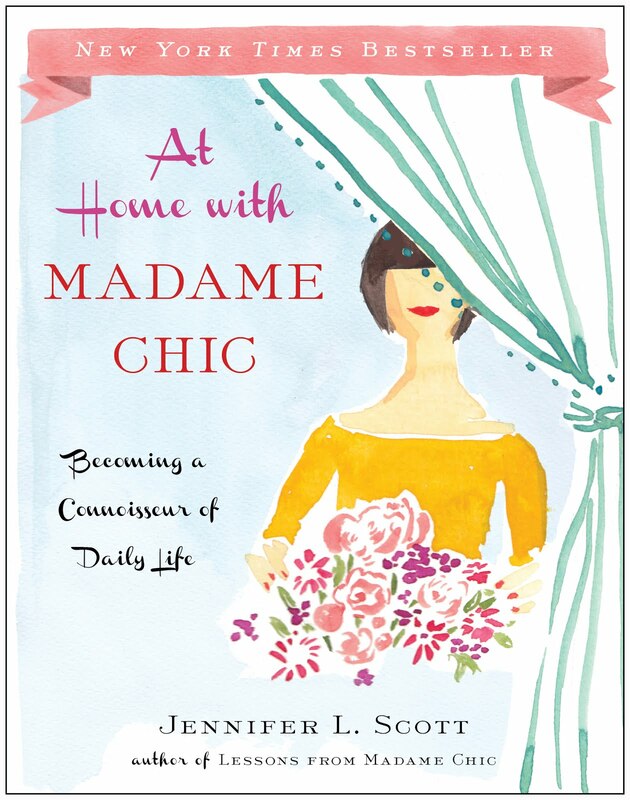 And what about those clutter hot spots and stagnant spaces as discussed in At Home With Madame Chic? With less possessions to begin with, the cleanup of these areas has been dramatically reduced. The clothing experiment is also quite telling. It has been the ten-item wardrobe on a diet. We are all wearing the same three or four pieces over and over again. There is less laundry, we still look great and there is no question about what to wear in the morning. Now, don't worry, I'm not going down to a three-item wardrobe (! ), this is only temporary, but this radical experiment has really opened my eyes to the fact that we can not only live comfortably with less belongings, we can thrive. Living with less encourages me to only bring items into my home that I adore and to constantly reassess what I have. I am quoted in Bankrate this week in an article called, Living Luxuriously for Less. Take one room in your home this week and get radical with it. Take out excess furniture, any clutter and all items that don't belong in that room. See what living in that room is like after you remake it. Enjoy its simplicity and use that room as a springboard to enjoy the same process to other rooms in your home. Naps, how do I love thee? Let me count the ways. I love thee after a good night's sleep. I love thee after a bad night's sleep. Naps seem to smooth out all the rough edges. Even a short one can be so refreshing. Naps or siestas used to be traditional in many cultures. It's another unfortunate aspect of modern life that schedules and routines no longer accommodate an afternoon rest. After all, who can guarantee a good sleep every night? Even when I was working, I used to nap during my commute on the bus. What does "nap" spell backwards, if you add a few letters? panacea! I wish everyone a good rest! Alexa, I have never been able to nap, but people who can swear by it! I'll never forget my time in Spain where the families would leave work for two hours to go home for a siesta. I like your thinking! in Beethoven's day the average amount of sleep people got was ten hours - TEN hours! No doubt lack of electric lighting and gadgets made this possible. But I think it tells us most of us are probably sleep deprived most of the time. Seven to eight hours is not for me! I have to admit that the biggest habit I am trying to break this year is that of staying up late because i do just want some time to myself. I'm aiming to reverse the trend by going to bed earlier and doing yoga in the morning - which definitely makes my life a whole lot better. I am a bedtime reader, but usually cannot stay awake for a full hour! Thank you for your belief and promotion of a quality life style. Your “Lessons from Madame Chic” has had a profound effect on my life. I have and continue purging, going from 3 full closets to only 1 small one. I have purged everything else in my house and I am constantly thinking about what else I am no longer using which can be sold/donated or simply dumped. Because of this book, I now only wear my best clothes whether to go to work, to teach or go grocery shopping on the week-end. I have gotten rid of everything that does not promote a quality lifestyle and that includes acquaintances. Thank you! Thank you Lise and to everyone who has signed the guestbook. I love reading about your evolving journeys! **This video was shot in my mother-in-law, Jane's Santa Monica flat in front of her lovely painting, "The Dancers" by British artist, Ashley Luff. 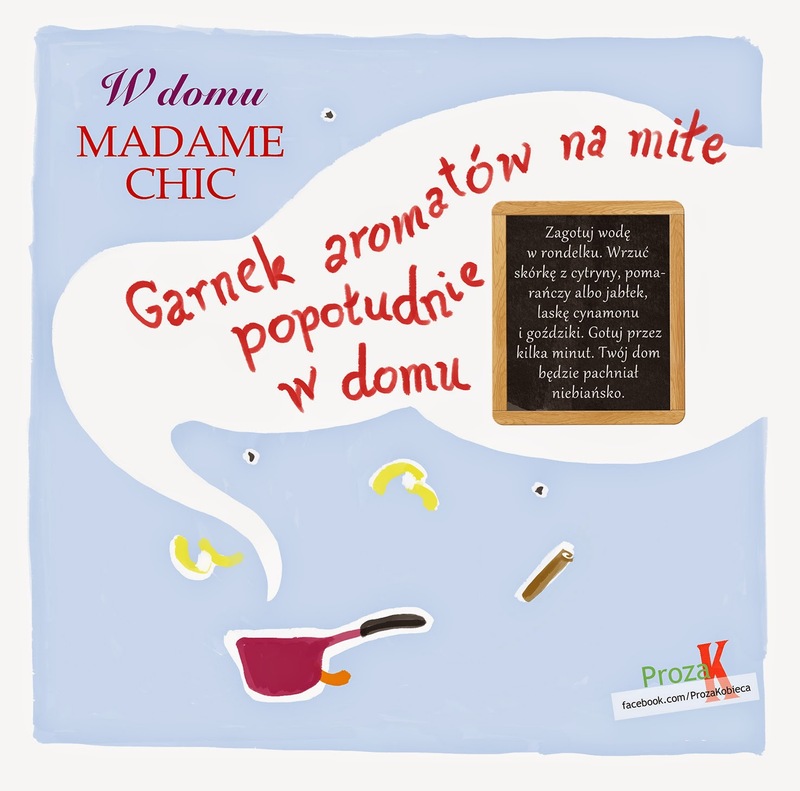 I am so happy to announce that my second book, At Home With Madame Chic, is now available in Poland from my Polish publisher Wydawnictwo Literackie. 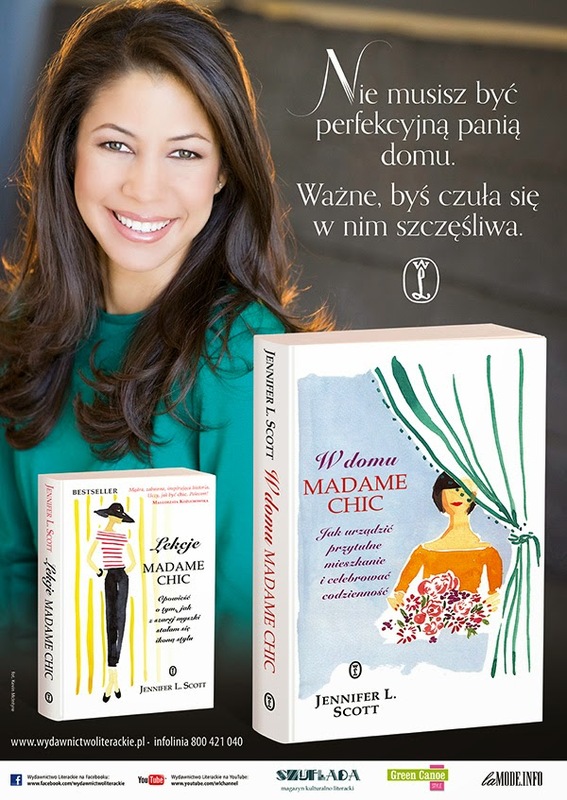 I have so enjoyed connecting with my Polish readers who loved Lessons from Madame Chic and can't wait to continue the discussion with you for this next book, as we journey into the intricacies of living well at home. The illustrations highlight the importance of delegating work in the home, show the aroma pot recipes mentioned in the book and encourage women to tackle their clutter hot spots. I thought it fitting to set this week's video to Chopin's Nocturne Opus 9, No. 1 because not only is Chopin my favorite composer of all time, but he is also Poland's most renowned composer. Thank you to all of my Polish readers for your warm reception! I'll see you all on Monday back on The Daily Connoisseur. Make sure you are not overstimulating yourself with media before you go to bed. In general, I like to read for up to an hour before I go to sleep as I find this really helps me calm my mind and settle into a satisfying sleep (that is until I am awoken by one of the little ones!). Adjust your bedtime if needed (yes, even if it feels painfully early) to get as much sleep as you need to operate well the next day. It could be that in your college years you could easily stay up until midnight or even 1am, but now you're in your 30s with a full time job, more stress and young children. It's time to push up the bedtime (this is my story, by the way). On those days when you are completely exhausted, go to bed as early as you can. There have been so many nights that I go to sleep at 7:30pm, right after I put the children to bed. These early nights are so necessary every now and then to recharge and wake up energized the next day. Bonjour Emily shares her Ten-Item Wardrobe journey in her latest blog post. Arushi Nayar from The Water Bakery references my ten-item wardrobe TEDx talk in her article on Minimalism. 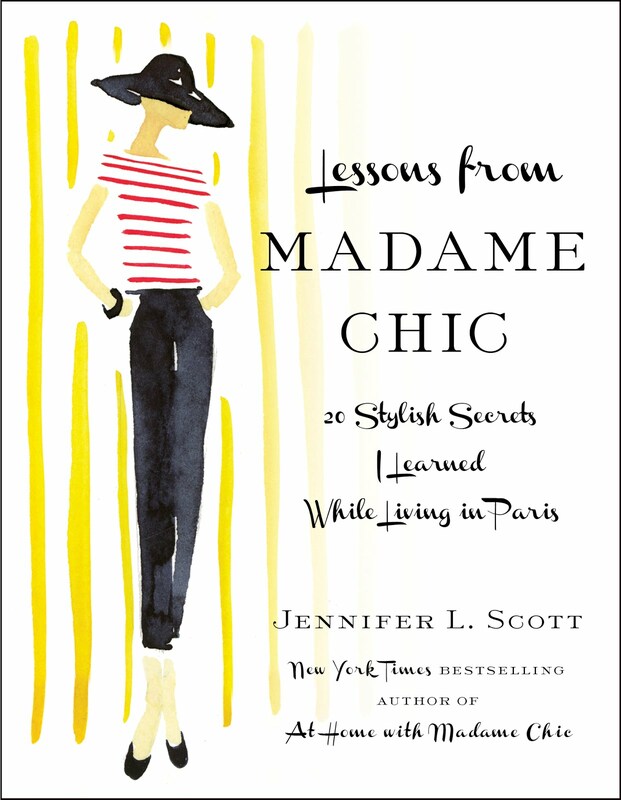 Mama's VIB lists Lessons from Madame Chic among her favorite Parisian style books. We live in a fast-paced, wired world where we are always connected... always "on". Feel empowered to disconnect from the shows, the screens and the social media and get some good old-fashioned rest. Make your bedroom a relaxing haven, free from devices and clutter. Make rest and sleep a priority in your life. I watched your vlog yesterday morning and had planned to spend the day slouching around (have the flu). After watching the vlog I put on a pretty cardigan to make the dress I was wearing, just look that bit nicer, I blow dried my wet freshly washed hair and put a small amount of powder makeup and mascara. Within minutes I received a phone call that I was about to get visitors. Not only did I have time to check the house was presentable I knew I looked good and there was no stress. Thank you for this timely advice. Today I needed no prompting to look presentable regardless of how I feel. Be sure to enter the Christy luxury bed linen giveaway here. This week I would love to know... what is your sleep story? Are there adjustments you can make to get a better night's sleep? This week’s video, by request, shows you what is in my handbag. You won’t find anything revolutionary in there, just the daily essentials to go through the day prepared. I love knowing what other people carry in their bags so let me know what you have in your handbag in the comment section below! The bag I am carrying is a simple leather tote by London Sole (French Sole if you are in the UK). Rugged and Redeemed loves At Home With Madame Chic and let us know in her Friday favorites. Don't forget to enter the Christy luxury bed linen giveaway here. If it's been a while, clean out your handbags this week. Throw out all of the crumbs and file away those receipts. Create a serene space in your purse to carry with you throughout the day. Thank you Jennifer for your words of inspiration and encouragement. I do feel that as a society will settle with the lowest denominator if not challenged. Our brains were made for so much more- to explore, to create, to learn more about the world and the people around us. Thank you Virginia Ruth... I love that quote! I just watched "Ida" - the wonderful Polish movie that won an Academy Award last week - I think it is brilliant. It's streaming on Netflix. Thank you Amy! I look forward to checking it out! If you have a recommendation to share with us, always let me know! See you next time on The Daily Connoisseur... let me know what's in your handbag! I had great fun shooting last year's How to Fold a Towel video featuring Christy towels (which, by the way, only get softer and fluffier with each use). 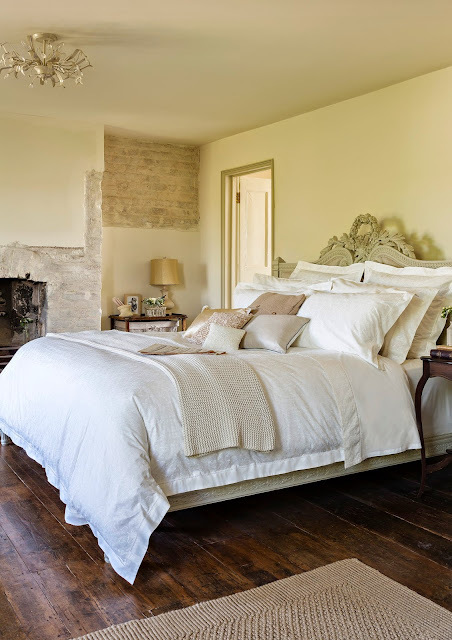 And now I have another amazing Christy giveaway for you, featuring their exquisite bed linens in Chantilly Cream. Christy had me select the linens to try out for myself and give away to a lucky reader of The Daily Connoisseur. Out of all of their beautiful bed linens, I chose chantilly cream for its versatility and elegant, traditional look. These beautiful Christy bed linens are made from 100% cotton and have a 200 thread count. The chantilly cream linens are characterized by intricate embroidery and ladder stitch detailing. I love sleeping in them. They are at once crisp and soft. They are the most luxurious linens I've ever used and I'm not exaggerating! And now for the fun part! Enter the giveaway below to win your own set of Christy bed linens in Chantilly Cream. Christy is kindly offering to give away one duvet cover, one flat sheet and pillow shams in the sizing the winner requires. Please note, this giveaway is open to US residents only (terms set by Christy, not by me). Please enter the giveaway via the rafflecopter widget below. The competition will run until Tuesday, April 7th. The winner will be announced April 10th. In addition to entering to win the bedding, Christy is also offering to give away a throw, matching pillow and decorative pillow. You can enter this competition on Christy's Website here. Good luck and I'll see you on Monday! Thank you for your electric response to last week's message, Refuse to be Dumbed Down. I am inspired by your passion to elevate society by cultivating your mind and seeking out the arts! I could have picked every single comment submitted to be the comment of the week. If you have time, scroll through and read some of the comments as you will get even more motivated. Amy asks about women over 50 and if they need more coverage than the le no makeup look provides. Le no makeup look is not about the amount of makeup worn, it is about the effect. The effect we are going for is a natural look that highlights our best features. If you need more coverage to even out your skin tone or make the eyes stand out, you can still do this and produce a natural effect. 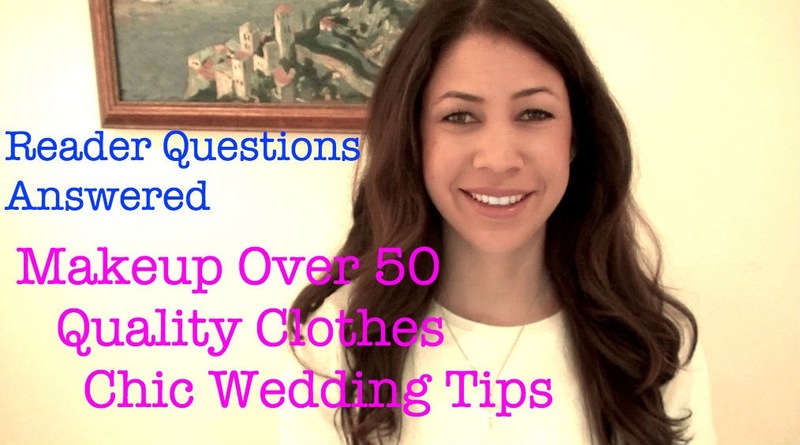 Xandra from Heroine Training asks about my advice for chic wedding planning. My number one bit of advice is to not get carried away with the wedding planning/ Bridezilla culture that seems to have eclipsed the true meaning of the day. Let's not be pressured by people to have the latest, biggest and most extravagant weddings but to forget what's popular in society and have a wedding that is special and won't put us into debt. 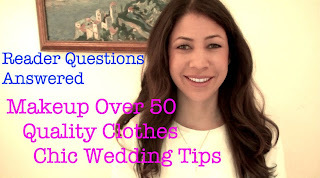 Katrina asks about how to spot quality clothes that are not necessarily pricey. No matter what the price is, you have to look at the garment and see if it's high quality. If it looks like it could shrink, it probably will shrink. If you are concerned about the quality at all (shrinking, potential for frayed hems or holes) then it is probably a lesser quality garment. Over time you will be able to hone in on a quality item quite easily. You will also be able to compile a list of brands that consistently produce quality clothes that you will become loyal to. Since I am not able to individually respond to all of your messages, I always keep your questions compiled in my notes and refer to them for these videos. If you would like to submit a question for a reader questions answered segment, be sure to leave me a comment below, on my video or on social media. The Daily Connoisseur blog and videos will now be posted every Monday (previously Sunday). Thanks for your understanding! 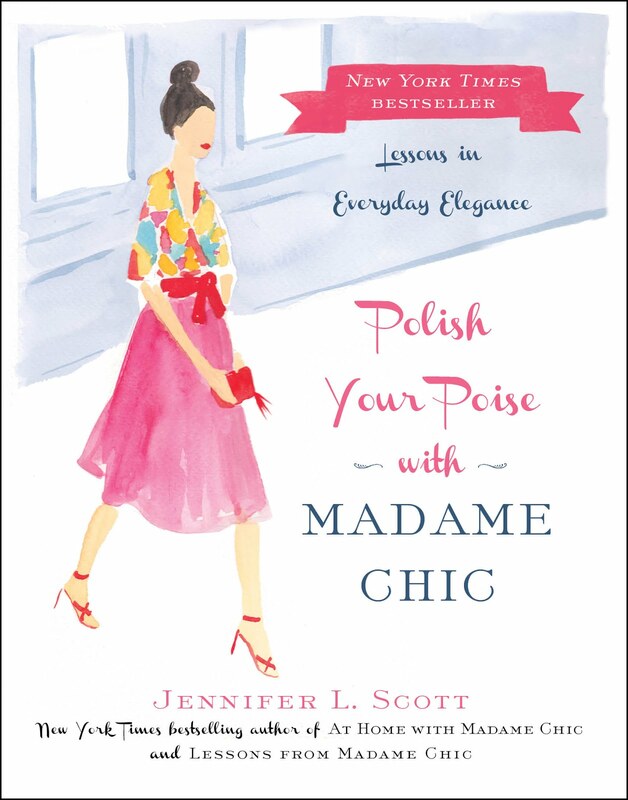 Diva and the Divine and The Shull Family blog loved Lessons from Madame Chic. You're right, it's important to learn from our bad purchases. I started to write down every lesson learned from bad purchases in a notepad app on my iPad, so I can refer to it before going shopping. For instance, I bought a beige sweater a few months ago but it has yellow undertones and it doesn't work at all with my complexion, I look sick when I wear it. So no more yellow-beige clothes for me. No more dresses that will shrink and end up being too short. No more coloured work pants, because I always feel better in black pants - skinny black pants, not straight leg, not bootcut. I also realized that I'm never fully satisfied with clothes from certain brands, so I stopped going to these stores altogether. Last September I donated 12 garbage bags full of clothes. Now I'm down to 30-40 pieces I really like. Mili, I love how thoughtful you are with your purchases! It's a great idea to reflect on what doesn't work for us in our wardrobes so we can get ever closer to embracing our true style in a workable way. I am stuck and overwhelmed with my wardrobe right now. I started a new job that requires a more corporate wardrobe, whereas I used to dress business casually. I don't know if I should put work clothes in one half of my closet and casual in the other? Thank you for your question! If you have a job that requires corporate dress that does not fit into your everyday life outside of work, you can create two capsule wardrobes- one for work life and one for downtime. You'll find that many of your extras and even core items will cross over and work and over time you will come up with a great fit for you. For my work, I often do fun events such as book signings or appearances and because of this I have a few more special occasion dresses in my extras, for example. Best of luck and let us know how it goes! Be sure to stop by the blog and YouTube channel this Thursday for a very special giveaway from Christy Linens.